My trip back from Luverne last night was an adventure. I was delayed in Worthington for almost 30 minutes because of a hail storm (no visible damage to the car). Then I was delayed for about 20 minutes near Jackson because of horizontal torrential rain. The next delay was from Fairmont to Alden because of high winds and wet highways. At least I missed the storm that hit the Twin Cities because it had wound down by the time I pulled into my driveway. It took almost two hours longer than usual, but it was worth it. After a few hours dealing with a work issue this morning, I went to Dawn Valley for their Memorial Day service. I wound up walking about a half mile to the cemetery, but got to drive in a little later. 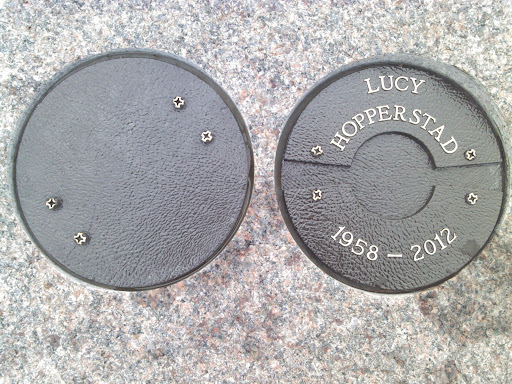 The service was very touching and I spent some time with Lucy while I was there. At least I was smart enough to bring Kleenex this time. My dad’s side of the family has a number of generations that served in the military here in the US and back in the “old country” (Norway). I entered college as the Viet Nam war ended and got to know a number of veterans, and was shocked at how despicably they were treated by society at the time. It was bad enough that many of them were drafted. They got forced to serve, then got treated like garbage when they get back. No wonder there were many who suffered greatly after coming home. Because of surgery on my left ankle (and not because of my left hand) I had a medical deferment. It was a moot point because the draft ended 28 days after my 18th birthday. While I couldn’t serve, I am very appreciative of those who did serve, either by draft or volunteering. To the veterans reading this, thank you so much for your service. Julie G. invited me to a BBQ tonight. Suzy and Bob were also there. I was so fortunate to be able to spend time with both my families this weekend. There is nothing like good food, lots of laughter, smiles, and hugs to lift one’s spirits. I am really blessed by having them in my life. It’s going to be a really busy week in the office, so this weekend was a great pick-me-up. Thank you for your support, for giving your time to reading this blog, and for keeping Lucy’s memory alive. 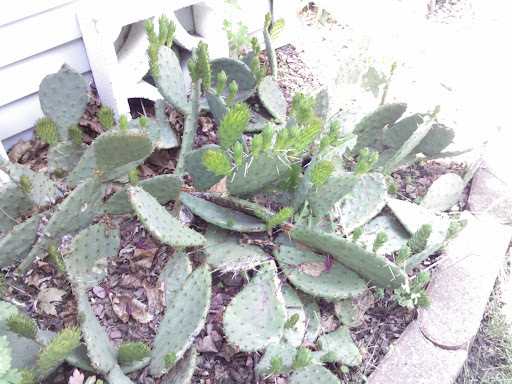 Cacti in Minnesota? You betcha! Prickly pear cactus is native to a small area in southwestern Minnesota. This stand is growing right outside my parents’ front door. Blue Mounds State Park has prickly pears growing throughout the park. I was too early to see them bloom this year. Even more rain is rolling in tonight. The forecast is for 1″ – 2″ tonight, and then decent weather tomorrow. Perhaps this will start drying out. I’ve had 7.7″ of rain this month already. That’s close to 4″ above “normal”. Even though it was a quick trip, it was nice to get away for the weekend. I think the last time I had a weekend away from home, excluding Lucy’s hospitalizations, was in August. Tomorrow is Memorial Day. Dawn Valley is having an open house and hosting a Memorial Day service. Please remember why Memorial Day occurs, and as always, give your loved ones some extra attention tomorrow. It rained heavily today. My electronic rain gauge quit transmitting after 2.33″. We set a rainfall record of 2.58″ today. The rain actually started about 10:00 pm last night, so we wound up with 3.39″ total. More rain is on the way later tonight into tomorrow late morning. The rain quit in Eden Prairie about 1:30 and moved out of Bloomington by 3:00. That must have been when her monument was placed. I hope to get back and visit my folks this weekend. It’s been awhile since I visited my brother Robert’s grave in Albert Lea. I’ll make a trip to the cemetery on my way to Luverne. With the ten hour days at work right now, it will be a short trip home. I’ll need Monday to get household chores done. I wanted the full dates for her birth and death but that supposedly wasn’t possible with the new design. Remember when nearly all the weather folks in the Twin Cities were bemoaning the drought ad nauseam? We’re not hearing too much about that anymore. Some areas are going to get over 3″ of rain tonight. I’ve been treated to a good sound and light show (thunder and lightning). Everything is green and lush. I think I’ll be picking blackberries in two weeks and raspberries in about four weeks. Neither apple tree bloomed this year, though. I met my cousin Julie at Jake’s City Grille in Eden Prairie after work. It was nice catching up a bit. I needed the decompression time. The garlic burger was very good. As we were leaving because of the impending deluge, “Second Chance” started playing as the background music. The rain even held off until I got home. Apparently the bronze vases at the local cemeteries are being stolen in large numbers. Just a couple of years ago, many bronze grave markers for veterans were stolen for scrap. One must be a particularly vile low life to steal from the dead. Remember to give your special someone a hug tonight. I finally have some May garden photos uploaded. The link should open a new window. Comcast is playing with bandwidth throttling, so it will be a touch on the slow side. I can’t find any hail damage from a couple of nights ago. The tree rats are doing more damage to the planters than the hail did; so much for my bluebonnets. It may rain the next couple of days so the surviving planters will be happy. 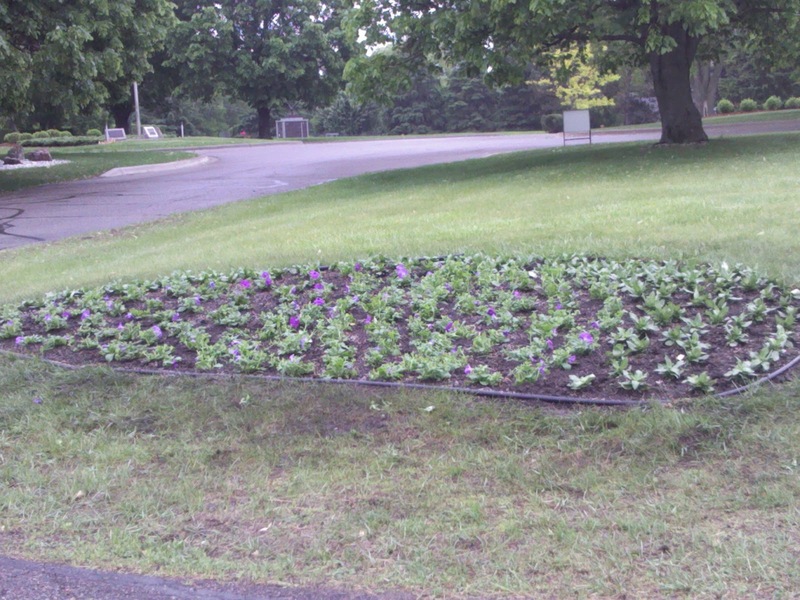 The cemetery has annuals planted in the garden across the driveway from Lucy. The petunias are cheery. Have a great evening and let your loved ones know they are special. 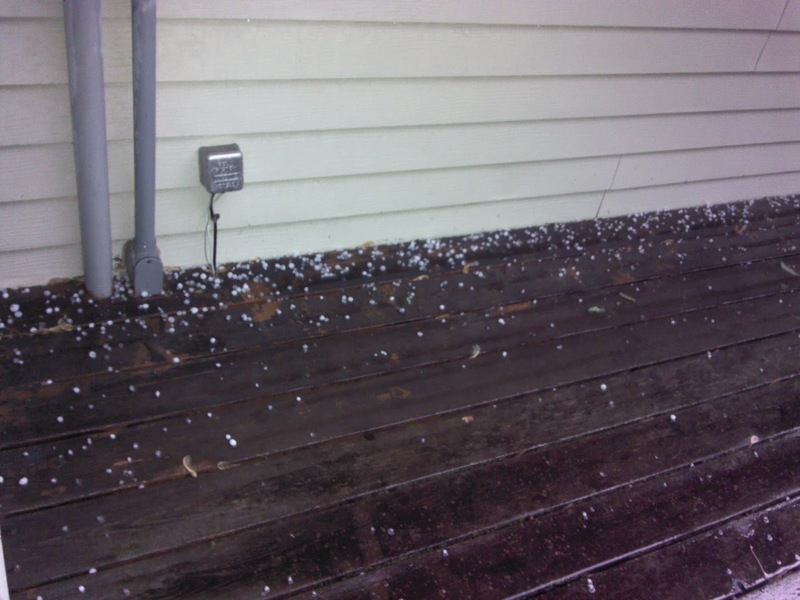 There may not have been much hail, but it was backed with some strong wind.